Unit have installed option MG0303B=BURST & MG0301C = pi/4 modulation. The MG 3670 B is a Digital Modulation Signal Generator equipped with a high-performance quadrature modulator. It provides the signals needed to develop, test, and evaluate digital mobile communications equipment and related devices with expansion units. 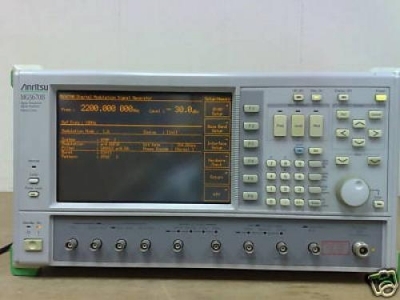 The MG 3670 B operates from 300 kHz to 2,25 GHz. The instrument provides a stable and precise output as well as excellent spectrum purity up to +13 dBm, even with modulation. In addition to testing receiver sensitivity and excess input, it can be used for testing IF stage performance and for evaluating device quality. A CMOS-level mode is provided for I/Q signal input. The input frequency band covers the CDMA spread spectrum band, expanding the range of applications. MG 3670 B can be used in combination with up to eight modulation units and a burst function unit simultaneously. - The MG0303B Burst Function Unit uses the frame and slot configuration stipulated by various communication systems and has a modulation pattern generator function and a function for ramp control of carrier burst signals. It can also handle data editing and scrambling.